2016 marked our 10th anniversary. It was an inspiring year, filled with exciting musical happenings! As the year draws to a close, we wish to thank you for your support of our music and entertainment services. We brought our entertainment and musical talent to many exciting returning events – and new ones. Expanded our collective’s musical collaborations to include talented local artists and additional instruments. LB’s new Yanagisawa professional tenor sax brings his collaborative and solo performances to a new level. Run live performances of original electro compositions by LB & MïxT BeatZ (incorporating Ableton Live, live instruments and field recording), at art and cultural events – InLiquid v16 Benefit, Fleisher Art Memorial Founder’s Award , and private events. Played for a special wedding ceremony and cocktail hour at World Café Live at The Queen Wilmington. As all the elements of the wedding celebration came together – personalized music repertoire and performance by Mélange Jazz Collective Trio – it was truly a wonderful and magical experience, musically and in every way. Whether the band performs on the local jazz scene or at special events, Mélange is known for its fresh artistic interpretation and contemporary arrangements of Jazz standards in addition to performing original compositions. Mélange Jazz Collective is a fusion of individual musical talents who all share a common love for jazz and combines a diverse range of musical backgrounds and styles inspired from Jazz, Latin, funk, blues, world, reggae, new music to classical. The collective performs as duos, trios, quartets, or as larger ensembles with a selection of instrumentation (drums, horns, percussion, jazz guitar, jazz violin and vocalists). Laurent LB Bass, with Jazz as his home base, has been pushing the boundaries of music for years. Well-known for his special solo electro-acoustic performances at private events, LB is recognized as a trendsetter who produces sophisticated cross-over genres and upbeat soundscapes through original compositions/remix in electro genre (EDM, DnB, techno, dubstep, house, downtempo) (MïxT BeatZ) and Jazz interpretations (LB Jazz +One) using Ableton Live cutting-edge music production technology. LB’s electro-acoustic acts – inspired by his wide musical experience in Jazz, World, Afro-Cuban, Latin, Electronic, and enhanced by state-of-the art equipment and sound design – integrate live performances on soprano and tenor saxophones (at times with the accompaniment of other live performers) with original electro arrangements. 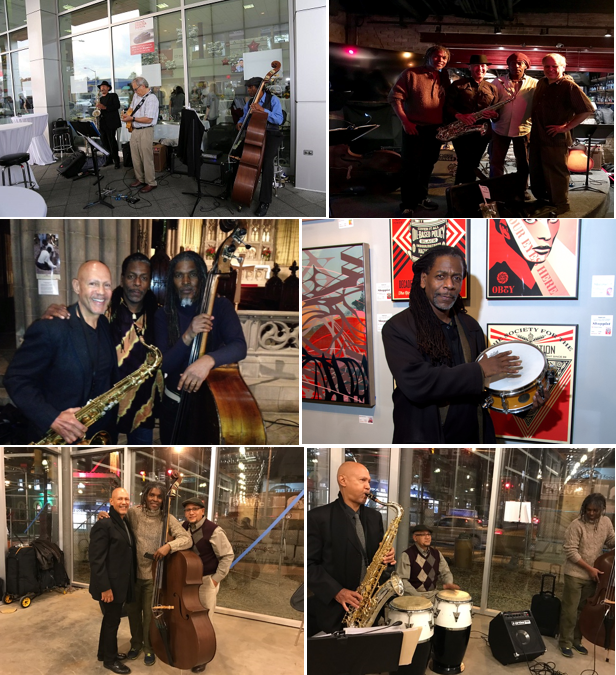 December 1, Mélange Jazz Collective Trio (sax/bass/guitar), Warmdaddy’s, Happy Hour hosted by Michael Tozzi and Ijazzglobal.com, 6:00pm-7:15pm, (public event). 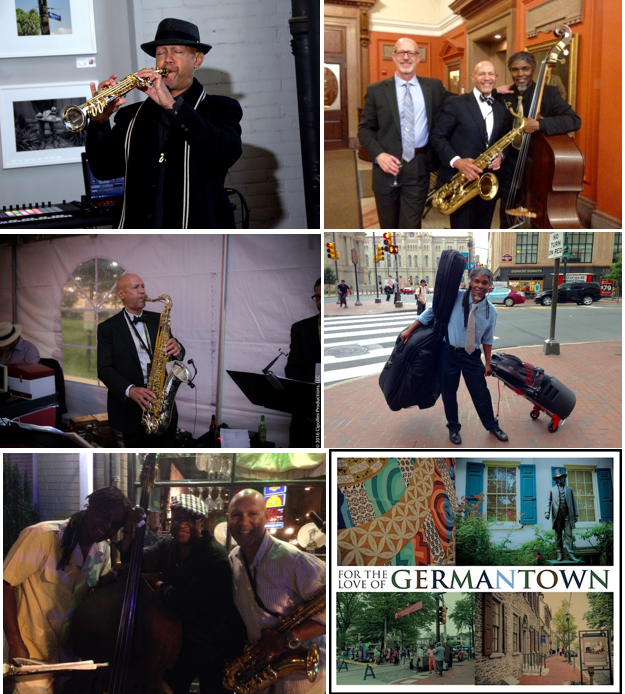 December 2, Mélange Jazz Collective Trio (sax/congas/bass), First Friday, The Bridge, Old City, First Friday Old City Reception. 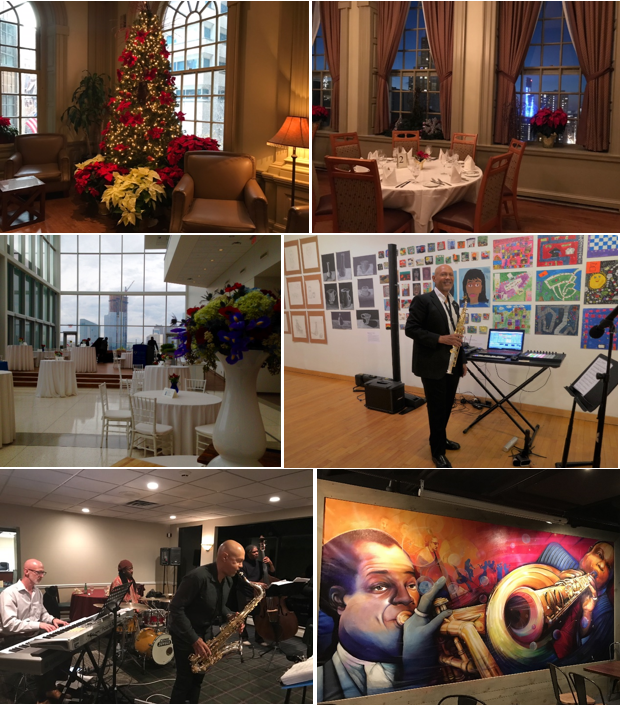 December 10, Mélange Jazz Collective Trio (keyboard/sax/bass), (private function), Davio’s. December 13, Mélange Jazz Collective Trio (sax, bass, congas), Wister BYOB Jazz Night (public event), 6:00pm – 9:00pm). December 16, Mélange Jazz Collective Trio, First Friday, The Bridge, Old City, reception. December 27, Mélange Jazz Collective Trio (sax, bass, congas), Wister BYOB Jazz Night (public event), 6:00pm – 9:00pm). January 5, Mélange Jazz Collective Trio, Warmdaddy’s, Happy Hour hosted by Michael Tozzi and Ijazzglobal.com, 6:00pm-7:15pm, (public event). January 17, Mélange Jazz Collective Trio (sax, bass, congas), Wister BYOB Jazz Night (public event), 6:00pm – 9:00pm). 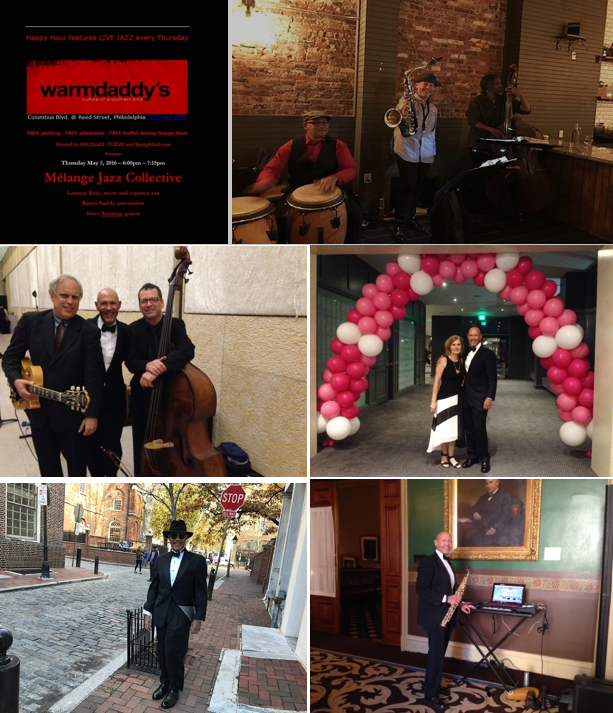 February 2, Mélange Jazz Collective Trio, Warmdaddy’s, Happy Hour hosted by Michael Tozzi and Ijazzglobal.com, 6:00pm-7:15pm, (public event). February 5, Mélange Jazz Collective Trio, Sunday Jazz Brunch, Manayunk Brewery Restaurant, 10:30am – 2:30pm (public event). February 25, Bert Harris Trio, Paris Wine Bar, 9:00pm – 12:00am (public event). March 2, Mélange Jazz Collective Trio, Warmdaddy’s, Happy Hour hosted by Michael Tozzi and Ijazzglobal.com, 6:00pm-7:15pm, (public event). March 5, Mélange Jazz Collective Trio, Sunday Jazz Brunch, Manayunk Brewery Restaurant, 10:30am – 2:30pm (public event). March 7, Mélange Jazz Collective Trio, private event, Pennsylvania Convention Center. April 2, Mélange Jazz Collective Trio, Sunday Jazz Brunch, Manayunk Brewery Restaurant, 10:30am – 2:30pm (public event). 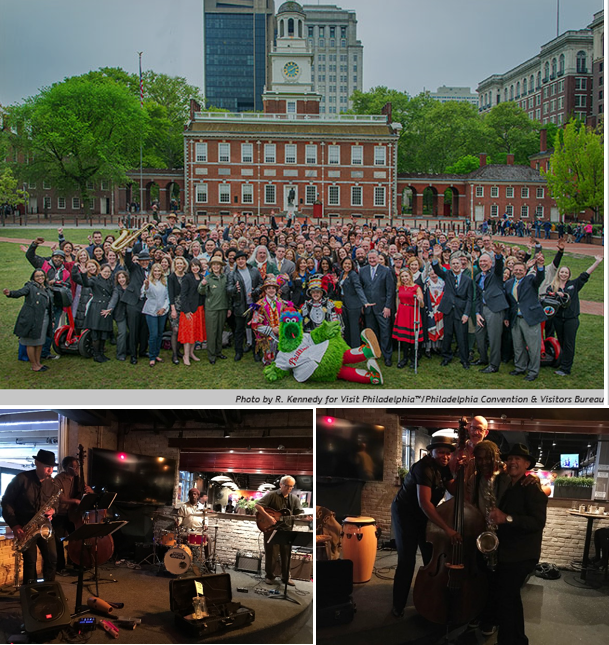 May 7, Mélange Jazz Collective Quartet, Sunday Jazz Brunch, Manayunk Brewery Restaurant, 10:30am – 2:30pm (public event). May 12, 2017, Mélange Jazz Collective Trio (sax, bass, keyboard), (private function). June 4, Mélange Jazz Collective Trio, Sunday Jazz Brunch, Manayunk Brewery Restaurant, 10:30am – 2:30pm (public event). MPI PHL, Monthly meeting, January 18, Courtyard by Marriott Philadelphia City Avenue. Independent Seaport Museum, Event Planner Open House, January 19. Jingle Jam 2017, January 25, presented by HSMAI and ILEA Greater Philadelphia, Philadelphia Downtown Marriott. Love is in the Air, February 23, 6:00pm – 8:30pm, The Horticulture Center. Wishing you a joyful holiday season and a happy New Year! We look forward to sharing our music and happenings with you in 2017.